Few things are more damaging to the appearance of a smile or a person’s self -esteem than missing and damaged teeth. The dental community has had denture treatment options for hundreds of years. Almost everyone has heard of George Washington’s wooden teeth. Fortunately, choices and technology have greatly improved since the Founding Father’s time and dentures are no longer hunks of wood. Today, patients have the choice of conventional dentures and bridges, as well as dental implants to restore their dental health and appearance. Even conventional dentures have come a long way. Most labs are able to create dentures and bridges that closely, if not perfectly, look like the patient’s natural teeth. With implants, the same holds true. The biggest difference between conventional dentures and dental implants is the implants. As the name suggests, dental implants are implanted into the jawbone and are permanent fixtures. This means the patient is able to treat the implants exactly like natural teeth when it comes to proper dental hygiene, including brushing and flossing. There is no inconvenience of removing the appliance for cleaning. There are other advantages to choosing dental implants as well. Each implant is carefully crafted to match the appearance of the missing or damaged tooth in not only appearance, but in color as well. While conventional dentures may be noticeable to a degree, most implants are next to impossible to spot. Additionally, implant patients have the freedom to go about daily activities without the classic concerns that go along with traditional dentures and bridges. 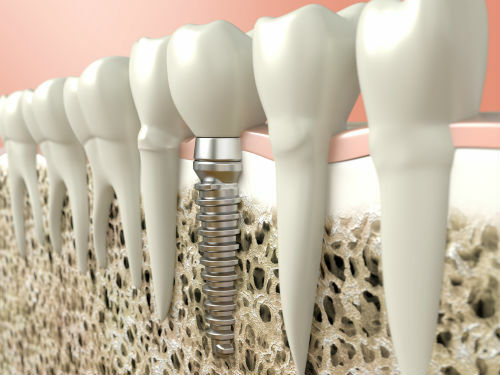 With implants, there is no slippage or the potential of food particles becoming wedged. This problem causes a great deal of discomfort for people with badly fitted dentures. Implants always fit and wear perfectly thanks to the precise care taken in creating them and the expert placement in the jawbone. More and more people are eligible for dental implants than ever before. If you think this dental restoration option is for you, contact Dr. Mechael and her friendly staff at El Cajon Family Dental for more information and a consultation visit. Now is the perfect time to explore your options and have the perfect smile.